They could start this week! 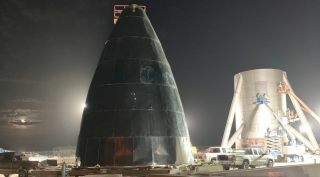 The hopper vehicle is the first phase in the overall testing program for Starship and Super Heavy. "Once we get through the hopper test campaign, we'll then be moving to orbital flight with Starship: getting up into Earth orbit and testing out systems on board and recovery,” said Paul Wooster of SpaceX during a March 17 presentation at the Microsymposium 60 here on commercial lunar lander systems. He didn't estimate how long that hopper test campaign is expected to last. SpaceX has plans to use Starship for lunar missions. The company announced in September it had signed up Japanese billionaire Yusaku Maezawa as the first customer for the system, then known as Big Falcon Rocket. Maezawa plans to fly a circumlunar trip around the moon on Starship as soon as 2023, along with a number of artists he plans to select as part of his "Dear Moon" project.